My projections are based on what I believe to be the easiest numbers to be able to predict: the province-wide numbers for each party. 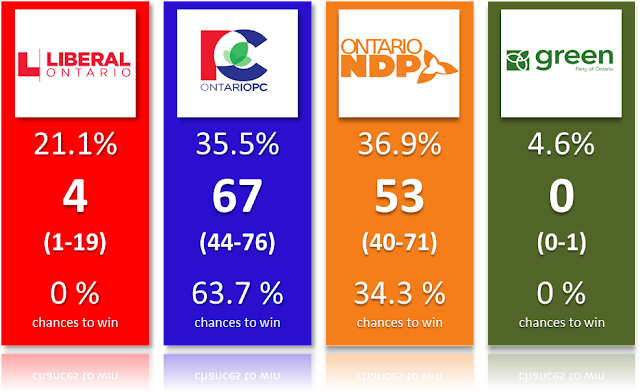 I base my model on the province-wide numbers because these will be the most accurate numbers provided by the polls, much more than regional or riding level data. With that said, I do make further adjustments if my regional averages are too far away from the polling ones. 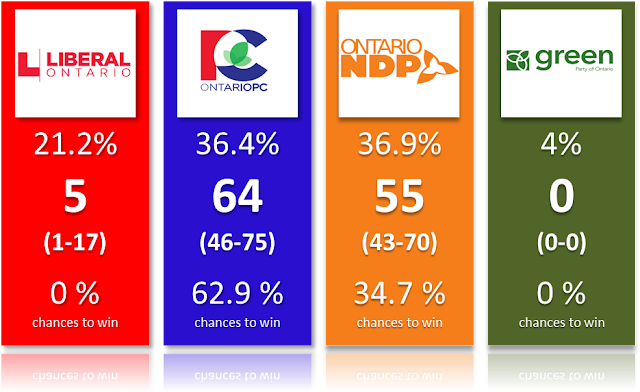 And when we have riding polls, even though they are less accurate, I do an average between them and my projections when the latter are 5 points or more off. 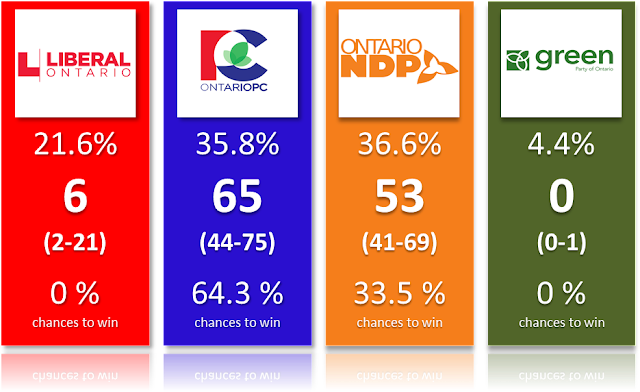 The problem right now is that the riding polls, all conducted by Mainstreet as part of their daily tracker (you need to pay $30 to have access) absolutely do not match up with my projections. This could obviously mean my model is wrong and this is indeed possible. But the riding polls also don't match with the current province-wide numbers. And this is problematic. How different are the two types of polls? The province-wide ones show a close race with the NDP slightly ahead (in the popular vote) while the riding polls are showing a landslide Conservative victory. Since the riding polls are behind a paywall, I can't reveal the numbers. But I can talk about general trends and differences. There have been 38 riding polls published so far. We don't have the exact dates (Mainstreet said they'd add this info) but they were all published over the last week (and the discrepancy between polls and projections have been more pronounced in recent days). Ridings are pretty much all over the province, from the North (Kenora-Rainy River, Sault Ste. Marie, etc), the East (Ottawa South and West-Nepean, Glenngarry-Presscott Russel, etc), the SW (Sarnia-Lampton, etc), the golden horseshow (Guelph, Kitchener-Conestoga, etc) or the GTA (Toronto Centre, multiple Brampton ridings, etc). It's a fairly varied "sample". If I compare my projections to these polls (when they were published of course), I currently seem to be overestimating the Liberals by 2.2 points and the NDP by a whopping 5.2 points while I underestimate the PC by 3.4 points. This is significant, it means the average PC-NDP gap is almost 9 points off. 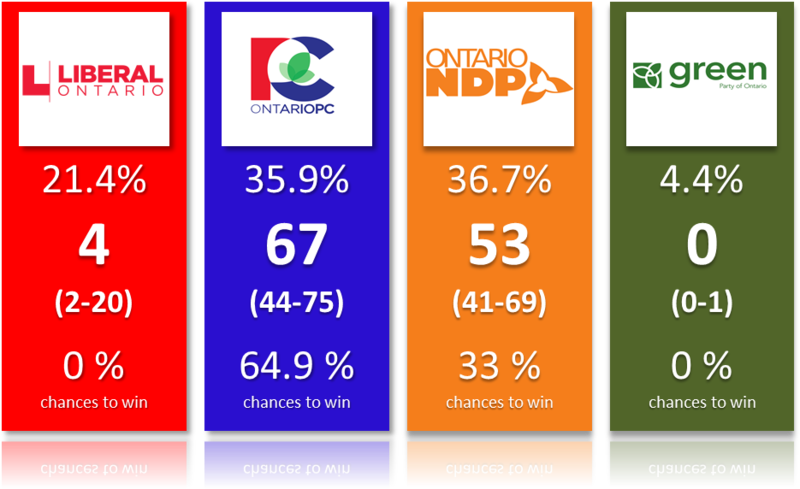 This leads to multiple ridings where I see the NDP ahead but the riding polls have the PC first. In some ridings, my model is projecting the NDP significantly up compared to 2014 while the polls have them barely higher. So again, at first, it seems more likely that my projections are wrong. And for a while I thought this was the case and I made the necessary adjustments. But the more polls we get and the more I think the issue is bigger than that. If we average the 38 polls, we get the table below. I also added the average deviation with respect to my projections. 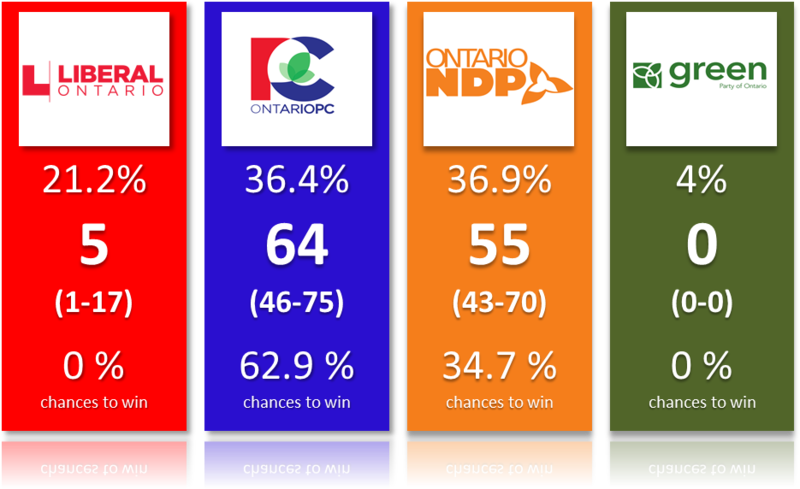 If I only use the riding polls published during the last two days, then the projections are underestimating the PC by 4.6pt and overestimating the NDP by 7.4! So the problem got worse. By the way, I realize some of you might object that these 38 ridings can't be a good "sample" of the entire province (think for instance if you only polled ridings in the 416, your results wouldn't be representative). I did a simple average of the results of 2014 and found 42%, 30% and 21% for the OLP, PC and NDP respectively. This compares fairly nicely to the official province wide results of 39%, 31% and 24%. 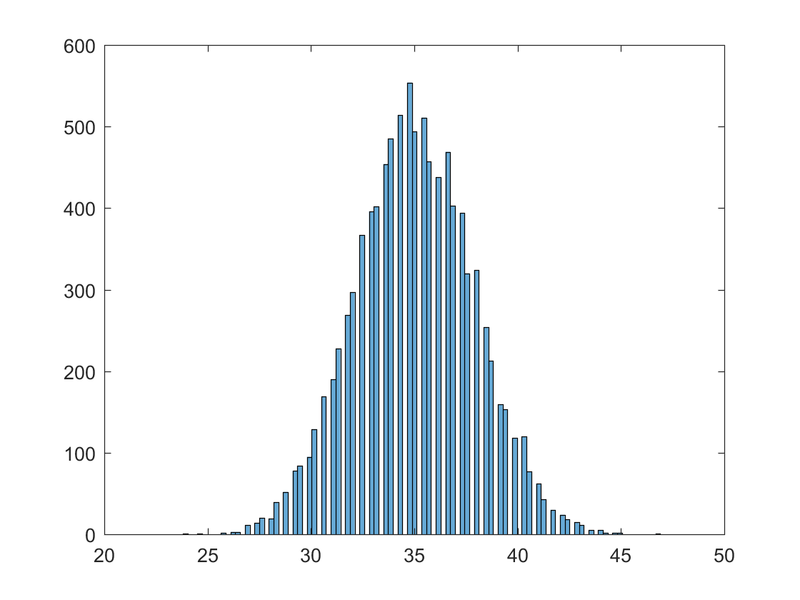 So while not a perfect sample, it's also not overly skewed. And anyway, when I compare them to my projections, the bias, if there is one, should be the same. 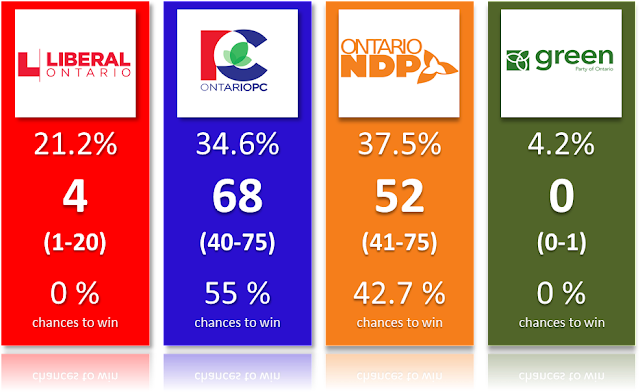 If riding polls were simply providing extra information, I shouldn't have a systematic over or underestimation with my projections. I should sometimes overestimate the NDP and sometime underestimate it. But it is clearly not happening. Notice also how the average difference between polls and projections match up with the overall difference. Take the 38.8% and subtract the 3.4 points, you get 35.4%, almost exactly the current polling average. Do the same for the NDP and you get 31.7%+5.2%=36.9%, there as well almost exactly the average. What this shows is that my projections are doing a good job at transposing the province-wide percentages into riding ones. 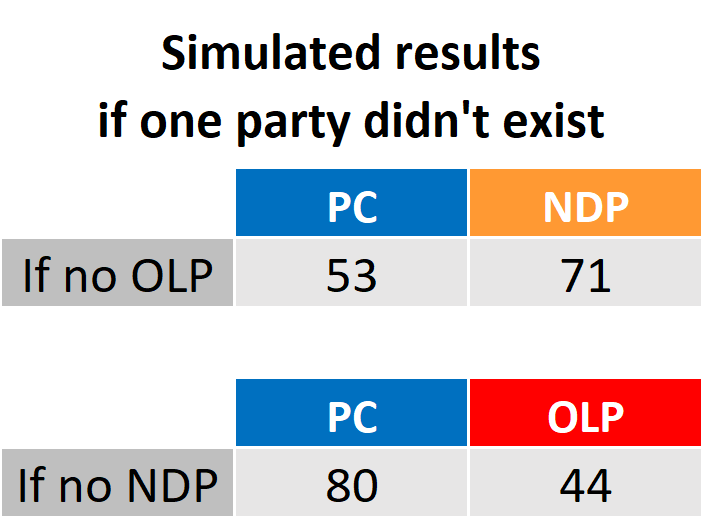 Therefore the average of my riding projections will give you the NDP ahead by around 2 points, as it should. The riding polls on the other hand are showing a situation where Doug Ford and the Tories would still be largely ahead and en route to a landslide majority. Landslide majority based on the riding polls isn't an exaggeration. If the Mainstreet numbers are right, the PC is about to win the entire 905, all of Central Ontario and Eastern (minus 1-2 seats in Ottawa). It would also win most of the Southwest including ridings we'd think the NDP would be ahead such as Sarnia-Lampton. The PC could even be competitive in the North. So really, the entire province minus some seats in the core urban environments. We are talking a 75-80 seats majority here possibly (what the projections were showing 2 weeks ago basically). The province-wide polls (along with regional polling averages) show a very different situation, one where the NDP is crushing it in Toronto, competitive in some of the 905, ahead in the Southwest and the North. This would be a close race with a slight edge for the PC. I don't know why the riding polls are so different. Maybe they were conducted a while ago? It's not even a Mainstreet bias as their provincial polls are in line with others. I'll ask Mainstreet about this. But for now, I can't use the riding polls. 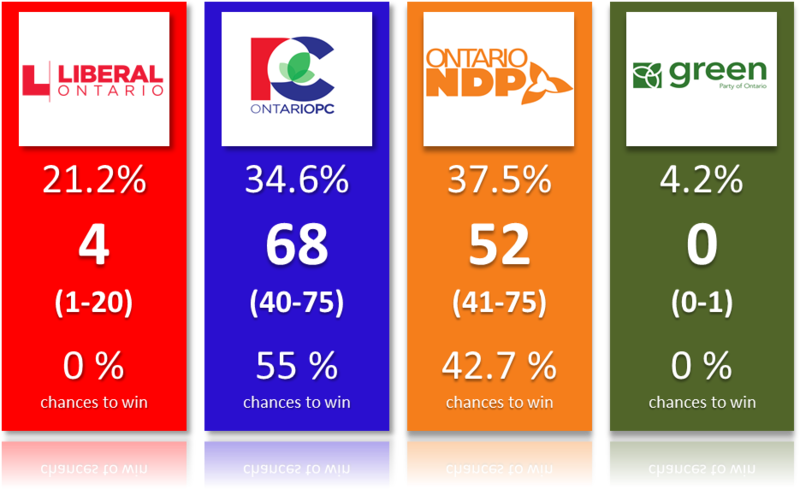 I believe the provincial ones more and therefore my projections more. 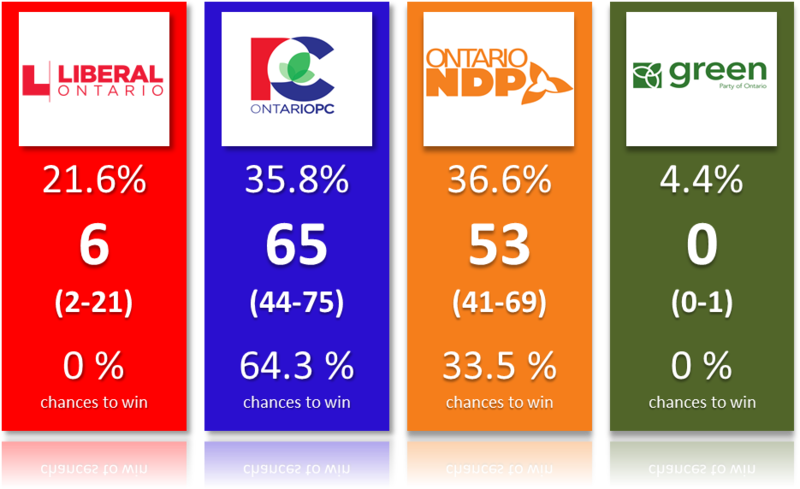 I'll use the data of some of these polls such as Guelph (showing the Green competitive) or the ridings in the North. For the rest? I'll remove the adjustments for now. Riding polls cost me two correct calls last year in BC and I think that this article should convince you that they aren't telling the same story. So I have to make a choice as to which polls I trust. And the choice between multiple province-wide ones or some riding ones is easy. After, I may be wrong and will regret it next week, but at least you know where I stand. Important notice: please do NOT use the numbers of this poll/experiment and tweet them. It was an experiment only. Plus, the poll was actually done last week, so the numbers aren't relevant anymore. This is the question I asked myself when I saw that we could order individualized Google Surveys. Some of you probably know what I'm talking about. You can install the Google Opinion Rewards app on your phone and once in a while you'll receive surveys. Usually this is to ask you what you thought of a store you went to (or Google thinks you went to through tracking). You answer and you get a magical 10-20 cents that you can use to buy apps, music and movies on the Play Store. Ok, I know what some of you will say: this isn't a valid poll! This won't work! This is the same as those non-scientific polls on websites. Not quite. Google has a robust database (not shocking) and can provide a good sample. In the 2012 US election, the second best poll was actually from Google Survey! There is a page about using it for election. There is a template that is recommended for best results (using a two question system where you first ask people how likely they are to vote). So look, I'm not trying to argue that a Google Survey is equivalent to a well designed poll by another firm. But if you think this is equivalent to those Sun Media polls on their websites for instance, you are dead wrong. Ok so as an experiment I decided, last week, to order a poll. I only asked one question because if you ask two, the cost increases significantly (instead of 20 cents per answer, it was over $1!). I asked the following question: "If the Ontario election were held today. Which party would you vote for or are you currently leaning towards?" And I offered a randomize choice of the parties with the leader's names as well as the "undecided" and "will not vote" options. The poll took 3 days, from May 22nd to 25th to collect the request 1000 observations. It was quite slow at first, which was disappointing, but picked up quickly at the end. I asked Google to ask the question in English to residents of Ontario aged 18 and over. Remember that this poll was done between May 22nd to May 25th. Unfortunately for me, I picked the few days where the NDP surged. I could actually see it by looking at the questionnaires coming in. 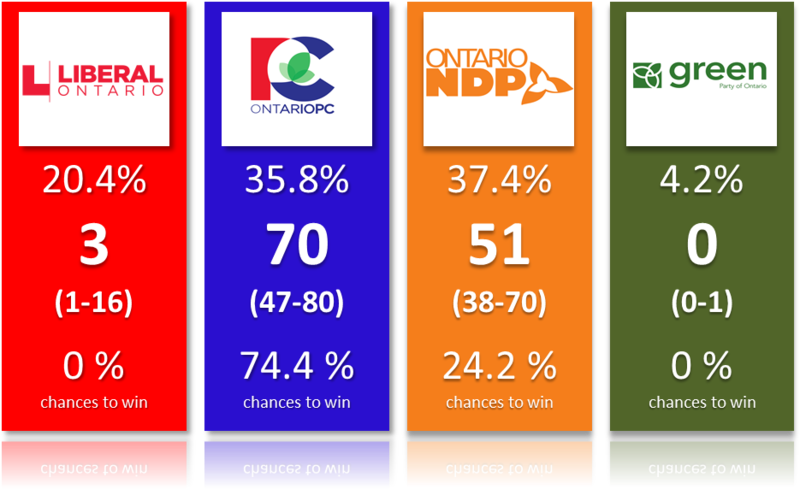 As reference, the polling average around that time was (excluding the Forum poll as I think it's an outlier and I don't have enough polls conducted between the 22nd and 25th to compensate for its crazy results) 21% OLP, 37% PC and 35% NDP (and around 5% Green). It says 1000 respondents but Google actually indicates that I only have 631respondents once weighted. Once the undecided and wouldn't vote are removed, we have roughly 400 respondents. A survey of that size would have margins of error of 4.8% 95% of the time. So the polling average actually falls within the results of this poll once we account for the margins of error. Except for the "another party". There is an obvious overestimation here. This makes no sense and I can't explain it right now. My results are quite similar to the tracker from Mainstreet published on the 23rd (it was around 21-38-34 at that date)! At 28%, this survey also got way more undecided than most polls (between 5% and 15% depending on the firm). To be fair, I only asked one question and even though it said "leaning towards", it might explain partially why I got so many undecided. So, was the experiment a success? Kinda. I haven't played with the raw file, trying to reweigh the data (which is possible since I have age and gender data from most respondents; I, however, do not have the region or city) to see if I could "correct" the weights to get better results. I also lost a lot of observations to the wouldn't vote or undecided, so a more serious experiment would require a higher budget to increase the sample size. Still, I find it pretty interesting that I was able to go online and order a poll for only $200 and this poll's results can actually be reconciled with the polling average. Plus, as I said before, my poll was done during a period of rapid growth for the NDP. The PC had a much bigger lead for the first day and the NDP slowly but surely caught up. Would it replace a true poll from a known Canadian pollster? Of course not! But there is some potential there. I wish Google would allow regional breakdowns though. I'll gladly share the raw data file with whoever wants it. Just reach me on Twitter or by email and tell me why you'd want the data. I only asked that you link to my site and mention my name if you'll use the data for a blog post or anything. There is only one week left in this 2018 Ontario election. What once was a safe lead for the Progressive Conservatives of Doug Ford has turned into one of the most competitive elections I've covered. By the end of the campaign, my projections usually give chances of winning of 80% or more to one party. This time around however, it is well possible that the race will literally be too close to call! That's not completely the case right now though. This isn't a perfect 50-50 race. As you can see below, the chances of winning (the most seats; I'm not even trying to discuss scenarios where two parties would make a deal) are roughly 65-35. 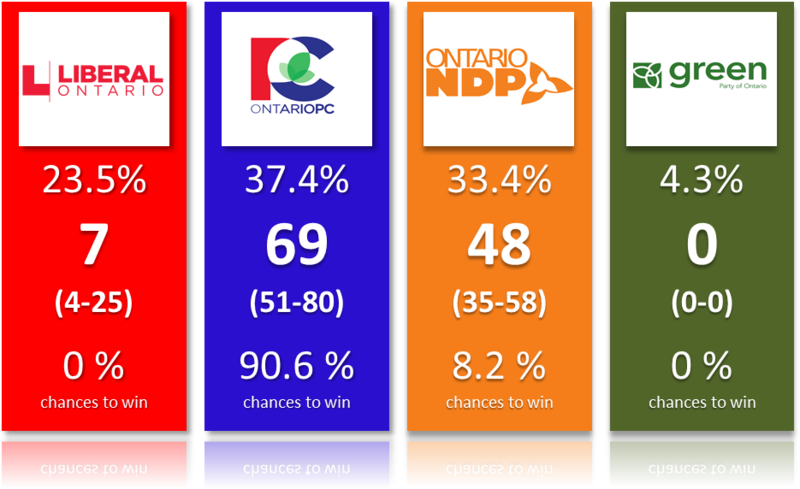 The only real certainty is that the Liberals of Kathleen Wynne won't finish first. Beyond this, not much has changed in the last few days. Voting intentions; Seat projections with 95% confidence intervals; Chances of winning the most seats. Notice that the "majority" scenarios are more likely. This is because the OLP isn't currently winning enough seats to make a minority the most likely scenario. Doesn't mean it won't happen (see BC last year), just that it's not as likely. If you are wondering what "others" is, those are mostly scenarios where there is a tie. 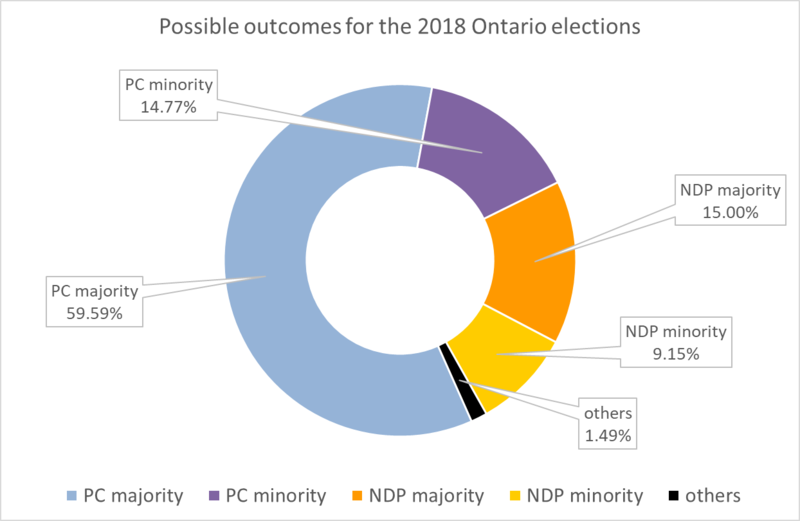 If the PC and NDP were to win the same number of seats, this would create an interesting but potentially messy situation. It could go weeks before we'd know who would become Premier. So I prefer not to speculate and just leave that as "others". As a BC resident, I wish Ontarians to have just as much post-election fun as we did last year! You can also see these projections on the map. This is the first time I did that and I must thank Rhea Donsman for showing me how (and some Youtube videos). It's most likely not perfect (no numbers for now, just colors) yet but it's fun, isn't it? 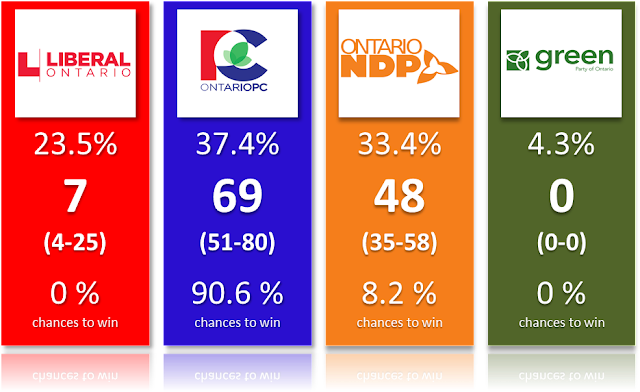 The main question some of you might have is really: how can the NDP be higher in average in the polls yet be given only 34% chances? The answer is really vote efficiency. Our electoral system being what it is, how the votes are regionally distributed can make a big difference. 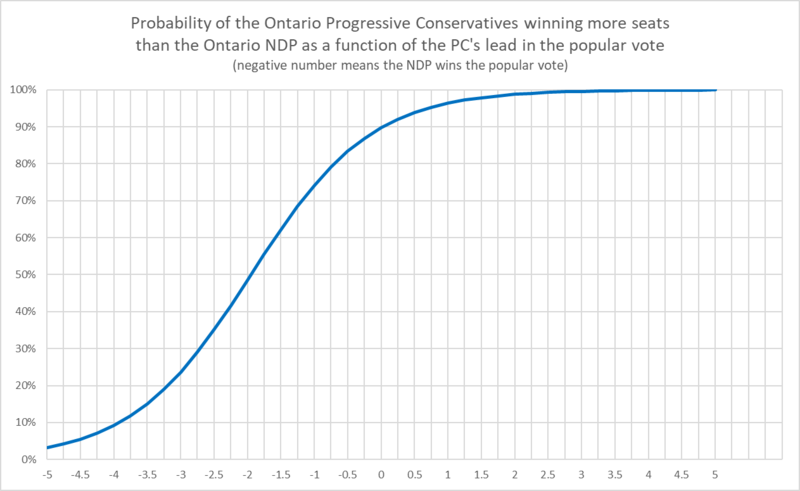 The NDP vote is simply less efficient in winning seats than the PC's. At least based on my analysis. 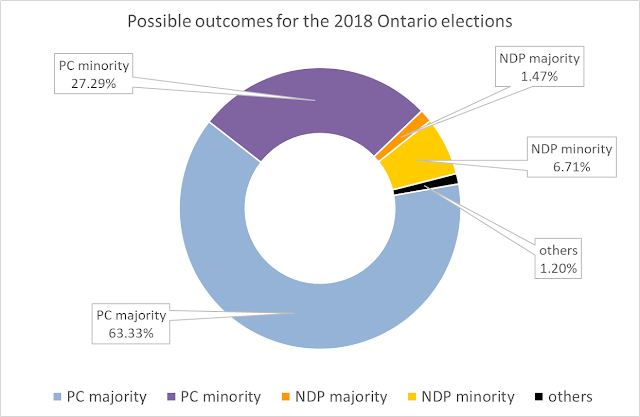 I had estimated in a previous post that the NDP would need to win the popular vote by 2 points if Andrea Horwath wantsed to win more seats than Ford. I stand by this analysis. It's not an exact science but 2 points seems to be the lead where this race would be 50-50. As you can see, the polling average doesn't place the NDP 2 points ahead. While the New Democrats had been rising in pretty much every poll over the last week (including some crazy numbers from Forum...), this trend stopped yesterday. Ipsos published a new poll that showed a rebound from the Tories. Mainstreet published a full poll to the public (as opposed to the daily tracker that is behind a paywall) where the NDP finally took the lead (remember that for a while, phone polls were not agreeing with online polls and continued to show the PC ahead, so Mainstreet having the NDP first was kind of a big deal). But on Twitter, Quito Maggi (Mainstreet's CEO) said that the lead was back to the PC in their new daily numbers. I think "rebound" will be the buzz word for the day. Maybe. At the end of the day, it's not really possible to determine right now who would receive the most votes. Polls aren't accurate enough to give us such a precise estimate. The best we can tell right now is that the NDP and PC are in a close race, around 35-37%. After, turnout and GOTV could swing the balance one way or the other. On top of regular polls, I also account for riding polls from Mainstreet. Their accuracy is way lower but they still provide information. Some of it isn't very good for the NDP. In most ridings in the GTA, I have found that my model was overestimating the NDP and/or underestimating the PC. This was the case in 3 riding polls in Brampton. So I made some adjustments. With that said, NDP supporters should know that Mainstreet's riding polls during the BC election last year failed to capture the NDP wave in the Lower Mainland. Still, I can't completely ignore this information. So what does the NDP need? They either need to sweep Toronto proper, increase significantly in the GTA or somehow manage to target key ridings here and there (1 or 2 in Ottawa, etc). The rest of the province isn't that interesting. 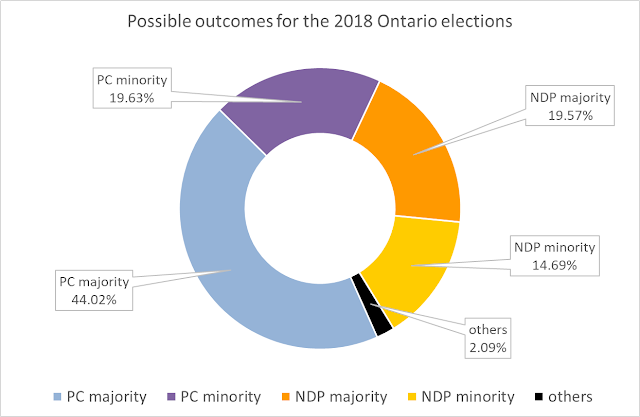 The North is already all NDP, Central Ontario is heavily PC, so is the rural South West. The NDP also already wins the urban centers (Hamilton, London, Niagara, etc). So really, there aren't that many possibilities left. Of course, all of this is assuming the race remains close. It's completely possible the NDP will surge in the last few days. We don't have polling data regarding the debate of Sunday (well I have my own Twitter poll but this is just for fun). Innovative said they'd have such data in their poll while Mainstreet said they won't. 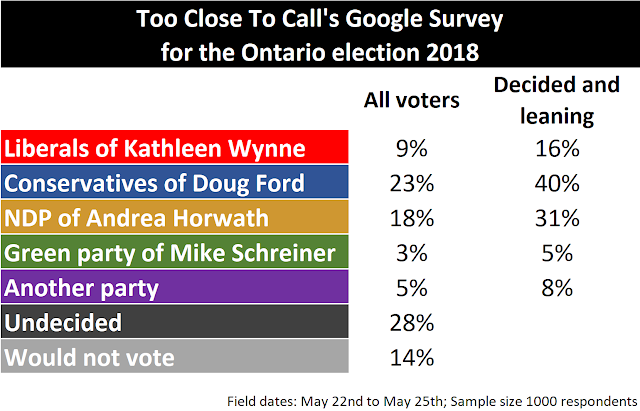 Having watched the debate, my subjective opinion is that Wynne did relatively well (after the horrible "Sorry not sorry") while Ford probably didn't lose any vote or convince anyone. So I don't think this debate will cause the NDP surge, but what do I know? Talking about a NDP surge most likely means talking about a Liberal collapse. Is the OLP at its floor or can it go even lower than 20%? It already did in some polls, just not in the average. 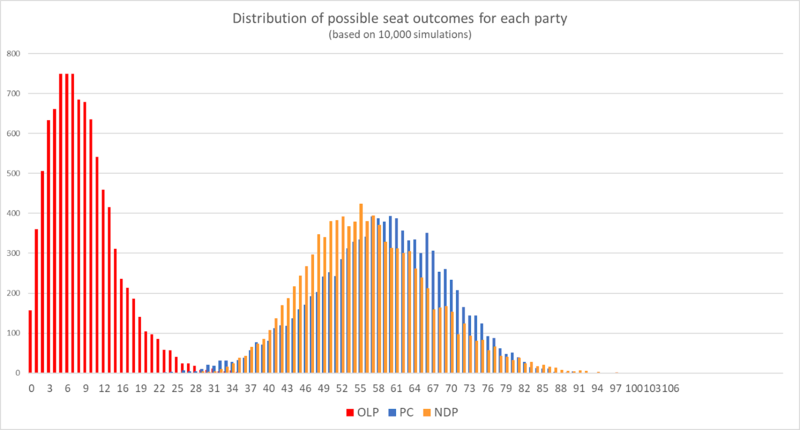 The OLP being projected so low means a minority is unlikely. But it doesn't mean the Liberals won't offer a fight in many ridings. Depending on how resilient they can be (and where), it could create quite a lot of close races and uncertainty. I'm not trying to protect myself in advance, but people maybe need to lower their expectations regarding projections. With such wide swings and wild cards, I don't anticipate my model (or any other for that matter) to perform as well as in BC last year for instance. As always, focus on the probabilities more than on the raw, top line numbers. That's all for now. I'll try to post an analysis regarding strategic voting during the afternoon or tomorrow. Also, remember that advance voting has started. As soon as we get data about the turnout, I'll make some riding adjustments.